It's always good to beat the Toronto Maple Leafs and it's even better when the 'W' comes in Toronto at the Air Canada Center. And what made last night even more fun for those of us in Sabreland was that the Leafs had no answer for Buffalo's Jack Eichel who scored the Sabres first goal and their last to give his team the 3-2 victory. 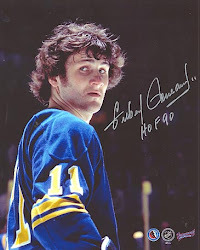 The Sabres also stopped Toronto's franchise record 13-game home winning streak and prevented them from breaking their franchise record for wins in a season and home wins in a season. And in overcoming 2-1 deficit with two third period goals, the Sabres dropped Toronto's record when leading after two periods to 29-3-2. Oh, and the win snapped Buffalo's four-game losing streak that saw them get outscored by a combined 16-2 despite outshooting their opponent in every game and by a cumulative 144-108 margin. To keep it in perspective, unless the Leafs incur a major disaster over their final six games they'll be in the playoffs for the second consecutive season while Buffalo is looking like they'll be finishing last for the third time in five seasons. But for one night, Sabres fans savored victory over the arch-rival Leafs. The talent discrepancy was once again definitive last night as Toronto controlled much of the game pumping 41 shots on goalie Chad Johnson and another 26, according to Leafs head coach Mike Babcock, "where we missed the net." "We've got to hit the net," Babcock told the gathered media post-game. Johnson has really been making a name for himself as of late. After an atrocious start to the 2017-18 season the 31 yr. old is 8-4-0 in his last 13 appearances which includes six consecutive wins against the Tampa Bay Lightning, Boston Bruins and Maple Leafs, the top teams in the Atlantic Division. As a surprise starter after rookie Linus Ullmark suffered an injury at the morning skate, Johnson thwarted Toronto through much of the game coming up with big saves when needed. "It's not how I want to prepare or how I want to find out, but you just deal with it," Johnson told the media afterward. "It's always nice beating that team regardless of the situation. Is there another little boost to it ending the streak? Yeah, it's always fun to be that team that ends it, especially Leafs and Sabres here." For as much as Johnson made a difference in the game, Eichel was a beast. And it began early when he stripped fellow superstar Auston Matthews of the puck in the Toronto corner. Buffalo's Zemgus Girgensons won a puck battle and fed a streaking Eichel who deeked the Leafs Freddy Andersen for his 23rd goal of the season. Eichel had another opportunity as he went in a on a 2-on-1 with Jordan Nolan, but Andersen thwarted Nolan. Sabres fans are still trying to figure out what Nolan was doing out there with Eichel to begin with. The Leafs had trouble with Eichel's speed and quickness all game and the only one to corral it was 235 lb. veteran defenseman Roman Polack, who got the angle on a streaking Eichel down the left side deep in the Toronto zone. Eichel was not to be denied as he streaked in once again the same way, beat defenseman Nikita Zaitsev and slid a one-handed backhand past Anderssen for his 24th goal. For as much trouble as the Sabres have had over the past three seasons, especially this one, and for as much as Eichel has been the forgotten one when it comes to the superstars of the future, namely Edmonton's Connor McDavid and Toronto's Matthews, he and the Sabres have owned head to head matchups. Eichel lost both of his first meetings against McDavid and Matthews, but since then he and the Sabres are 6-0-0 in those head-to-head meetings. 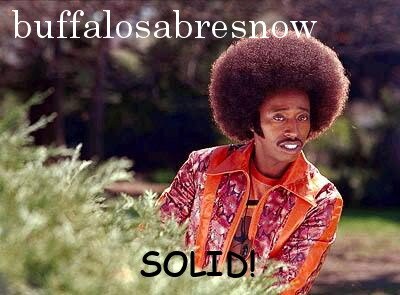 In all the Sabres are 6-1-1 vs. McDavid/Oilers and Matthews/Leafs with the Sabres those two teams by a combined 27-15 margin. Head to head Eichel has more points in those matchups than McDavid and Matthews combined. In four head-to-head games vs. the Oilers, Eichel has six points (2+4) while McDavid has four (2+2) and in four against Leafs Eichel has eight points (4+4) while Matthews has three (2+1.) Eichel also has a cumulative plus-5 rating in all eight games while McDavid and Matthews are a combined minus-3. The Sabres are what they are this season, a bottom-feeder destined for a top pick in the draft. There's a lot of work to be done with a roster that needs some serious tweaking. More help is on the way as forward Casey Mittelstadt, who has speed, skill and hockey smarts, just signed his entry-level deal and is expected to make his NHL debut on Thursday. One never does know what to expect from this team moving forward, but at least we've come to expect good performances against divisional foes like the Lightning, Bruins and Leafs. And beating them, especially the Leafs at Air Canada Center, is a drink of cool water in the depths of a hellish season.